Options/NET 11.0 gives you the capability to quickly and easily analyze complex multi-leg option positions. Analyze multi-leg option positions such as Straddles, Calendar Puts, Covered Calls and more using Options/X or Options/NET. Full souce code demo is provided. It is possible to quickly and easily create profit-loss graphs for any position, eg Iron Condor, Calendar Spread, Ratio Write, Covered Call, Strangle, Straddle, Long Put. Any multi-leg option position can be created and then analyzed in terms of profit potential, profit ranges, maximum profit or losses in a range or at all, break-even points, probability to make a profit, total cost for the position. 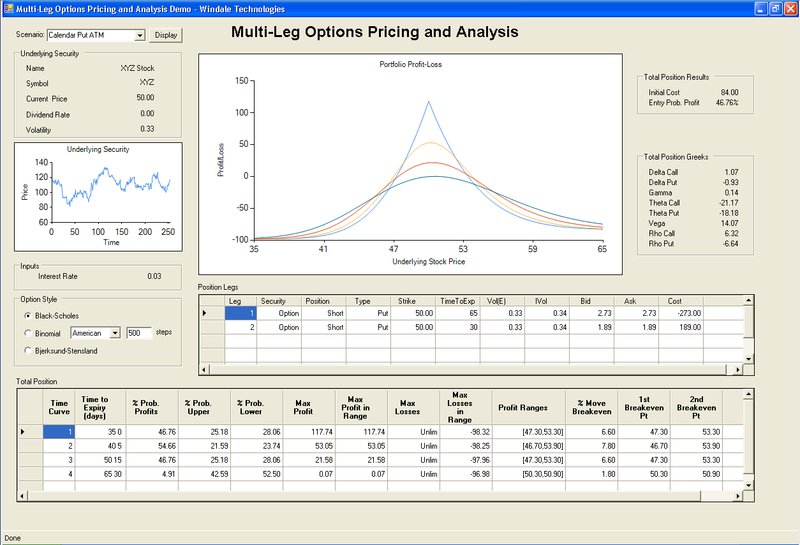 Multi-leg options profit-loss application created using Visual C# 2008 with MSChart .NET 3.5 and Options/NET. Options/X can be used to create the same application in Visual Basic 6 using Options/X. This page shows sample applications built with Options/NET. This example prices and analyses GE March 2002 Options. The data is also included with the sample application for S&P500 and others. The graphical display shows Volatility Skew for this stock. You can use Options/NET in a VB.NET, Visual C#, Visual C++, Delphi, Borland C++ Builder, or an Excel spreadsheet to quickly analyze your data. The full source code for this sample application is supplied with Options/NET so you will be able to start getting results in no time. 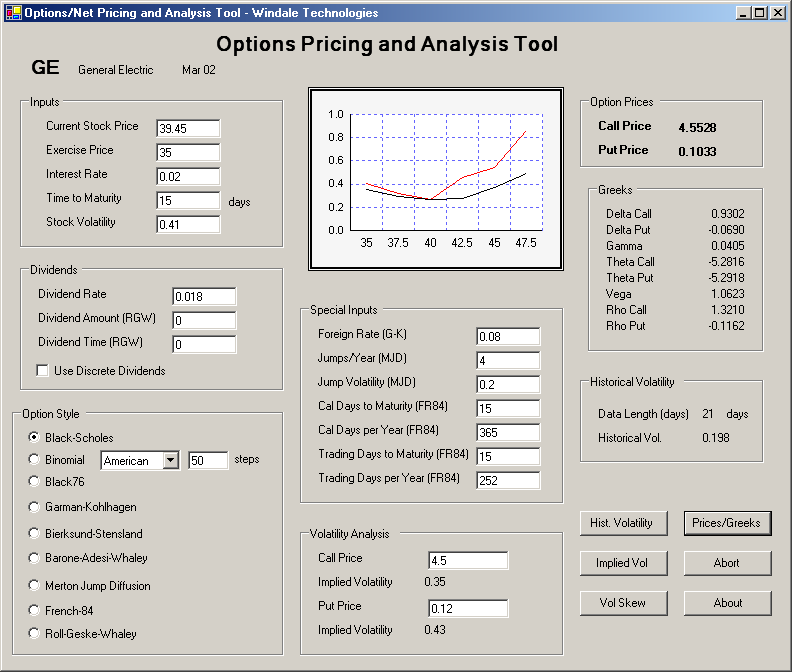 Click here to try Options-Pricer ASP.NET Sample Application. Note: Full source for this web application is provided with Options/NET. Pop-ups should be allowed for your web browser. This application was built using Visual Basic but it could just as easily have been built with Visual C++.NET, Visual C# or any other compatible programming environment. Each function is accessible in just one line of code. You are free to use the source code for this application as part of your own when you purchase Options/NET. 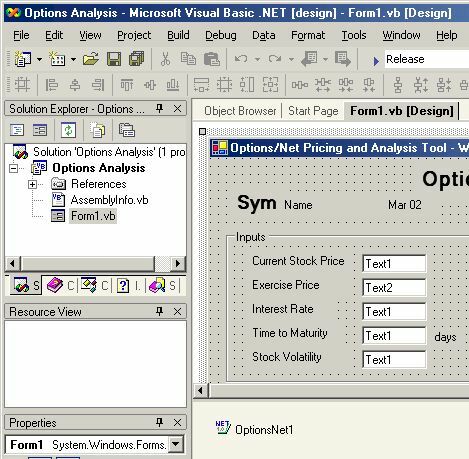 Using Options/NET is simple - once installed, the Options/NET icon appears in the Visual Basic Integrated Development Environment (visible in the lower right corner of the General ActiveX components above). Functions are accessed in a single line of code! Copyright © 2001-2016 by Windale Technologies, Pty Ltd. All Rights Reserved. Software GUI design, and site contents are protected by US and International Copyright Laws and may not be duplicated by any means without the express permission of Windale Technologies. Patent Pending 60/945347. Disclaimer and Risk Statement: Futures and options trading involve substantial risk. The valuation of futures and options may fluctuate, and as a result, clients may lose more than their original investment. In no event should the content of this web site, the results obtained from using software provided by us, or the content of the source code sample applications be construed as an express or an implied guarantee by Windale Technologies that you will profit or that losses can or will be limited in any manner whatsoever. Past results are no indication of future performance. Information provided is intended solely for informative purposes only. Please refer to our Terms of Service for more detailed information.